One Direction (don’t pretend you don’t know who they are!) supported the Action/2015 campaign a few weeks ago. The engagement on Twitter was amazing, I’ve never seen so many RTs so quickly but you didn’t see any of that action on my Twitter feed (follow me at @MrTomBaker). That experience and this article on the role of social media in people thinking that Labour would win the election got me thinking about how Twitter is a big echo chamber with lots of political people talking to each other but often few campaign cutting through beyond that. 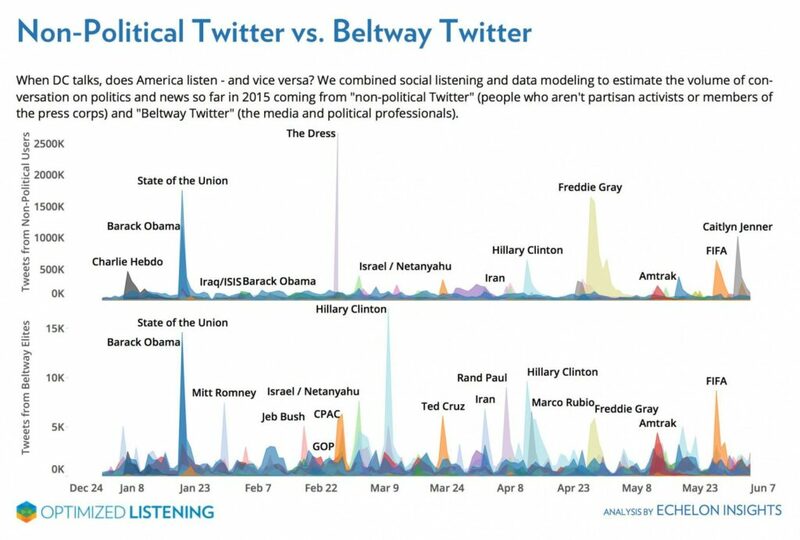 I’ve not seen any similar research from this side of the Atlantic, but this graphic, which looks at what those inside D.C. Beltways (the US equivalent of the Westminster bubble) posts on Twitter versus what everybody else in the US posts on Twitter is instructive. Good post Tom — super interesting and really relevant. On the For The Love Of… campaign we’ve been trying to reach out to wider, more mainstream audiences on climate change, but it feels like we have a long way to go. I wonder how similar the picture looks for other campaigning issues? Thanks Joe. That’s really interesting research. Reminds me of a couple of other examples – David Hudson (https://twitter.com/dhudsonUCL) did some interesting work on who was talking to who in the IF campaign. I can’t seem to find it online but showed the same thing as the climate research. Yeah interesting Tom — a good reminder about Kony, takes it back to the outreach (starting grassroots, offline) you do paying off in what happens on social media. Maybe where we’re at on climate change and development on social media is a good reflection of where grassroots outreach is at.